Last week, the pairing of Venus and Jupiter was a beautiful sight in the clear evening sky at dusk. Unfortunately, a large low pressure cell moved into the area about 3 days ago. It has remained cloudy throughout. Today, December 1st, like clockwork, it snowed here in Carbondale Illinois. This morning when I went to school around 9 AM, it was snowing moderately. None of the snow stuck however. It just remained cold and cloudy. I had checked the Weather Channel on line for the last two days, and their hour by hour forecast suggested that it would remain cloudy till about 3 AM this coming morning. I reluctantly accepted that the conjunction would be clouded out. However, at 5:30 PM I stuck my head out the door one last time to see if there were any breaks in the clouds. I saw a brief glimmer of what must have been Venus. I was encouraged, and put on a coat and went outside into the cold air. I could see a few break in the clouds to the northwest. Gradually, a bit here and a bit there, small clear patches would float over the trio. At first I could only see Venus and some of the moon. Eventually, Jupiter showed also, but never all three at once. More clear sky appeared. Entire clear patches broke open over head, showing the Summer Triangle, now like a great arrowhead pointing to the conjunction to the south. At last, all three appeared at once! Still I could see no earth shine on the crescent moon, and the full brightness of each object was variously dimmed, so that Jupiter would be brighter than Venus, then the moon would be brightest, and so on. Now a large patch of fully open sky shifted toward the three objects. Most of the sky was now clear, more or less. Only 20 minutes before, it had been about completely cloudy. I was right on the edge of the low pressure cell, just in time!! 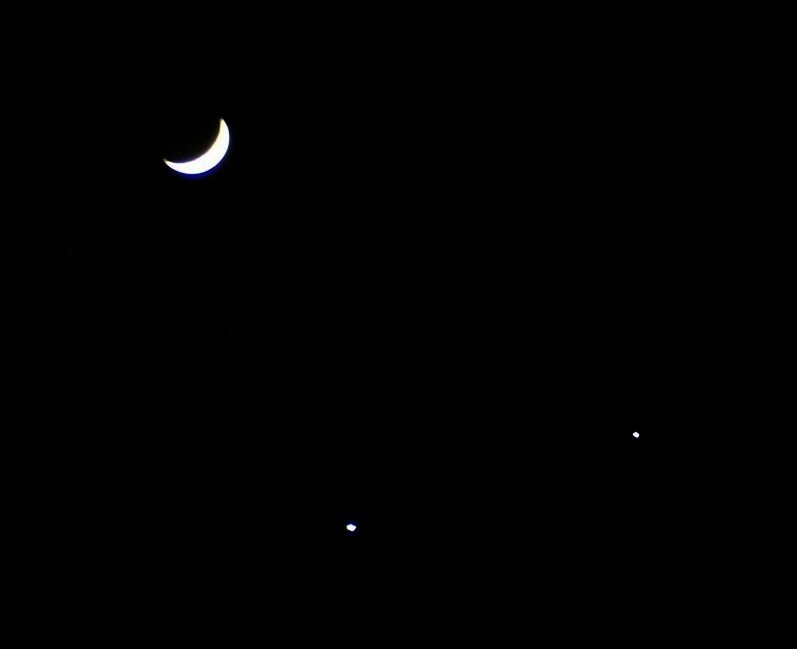 The moon, Venus, and Jupiter finally broke into completely clear sky, and their full brilliance shone forth. They formed a dog legged line stretching through the solar system. Their light was cheering in the cold air. At that minute, a security man pulled up his truck some dozens of yards away, its headlights shining into my face and view of the glaring trio. They are building some houses, and he was making sure no one (like me standing in the middle of this field) was messing with their tractors. I said to him "Have you seen the planets? The moon, Jupiter, and Venus! " I saw him turn to look. "The bright one's Venus" I said. He was an interruption to my observing, but another bit of clouds was coming, and me and my dog were getting cold, so I had to go in anyway. At least I had gotten to show the event to someone who might have never seen it!! Again, the Great Spirit that moves all saw to it that another of his members of creation got to behold his handiwork! Just to think, when I first stuck my head out the door, it was completely cloudy, and here a half hour later, I could see the group all the way back to my door. The Venus-Moon-Jupiter conjunction of December 1, 2008 reported from Carbondale Illinois for the Vega Sky Center.